The bridge must be supported by adjacent, in many cases, healthy teeth, which must be drilled down and capped. These newly drilled teeth then are used to support the bridge across the space where the teeth are missing. They are weakened in the process, and often fail over time, creating more dental problems. The bridge does not address the problem of bone loss after natural tooth removal. The bone in the area where the teeth are missing will continue to deteriorate, and eventually leads to functional and esthetic problems. 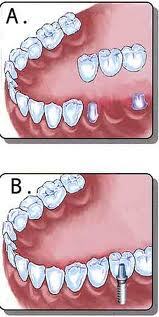 Some spans of missing teeth are too large to be treated with a bridge. Many bridges last a relatively few number of years before needing to be replaced. Poor or even moderate oral hygiene habits will cause teeth supporting bridges to fail more quickly. In contrast, dental implants are placed directly into the bone where the natural teeth are missing, and do not involve the adjacent healthy teeth being touched. Dental implants also prevent or reduce the further loss of bone, and can last a lifetime! -- illustration B.